Here they are. The last two breads from HB in 5. And a good thing too, since Jeff and Zoë's new book, Artisan Pizza and Flatbread in Five Minutes a Day is scheduled to be released on the 25th of this month. We finish up with a continental flourish: Il Bollo, which its Italian for The Ball, and Pain au Potiron, which is French for Pumpkin Bread. I got a pie pumpkin potiron for the Pain au Potiron. It is, after all, the last assignment, so I went all out. According to our friends at Wikipedia, pumpkins are thought to have originated in North America, although that is not entirely certain. But the oldest seeds found so far, dating back to 7000-5500 BCE, were found in Mexico. Pumpkins are monoecious, which I now know, thanks to my new sensei Denise with the Ohio Master Gardener Program, means having separate male and female flowers with both types of flowers on the same plant. Over 1.5 billion pounds of pumpkins are produced each year in the United States. 95% of the pumpkins which are grown for processing are grown in Illinois, and Nestle produces about 85% of the processed pumpkin. As goes the weather in Illinois, so goes the availability of canned pumpkin! Growing giant pumpkins is a passion for some. There was a neat PBS special, Lords of the Gourd: The Pursuit of Excellence, about growing giant pumpkins for the annual Cooperstown Weigh Off. The DVD is available from Netflix, or it may be on your local PBS station this Fall. 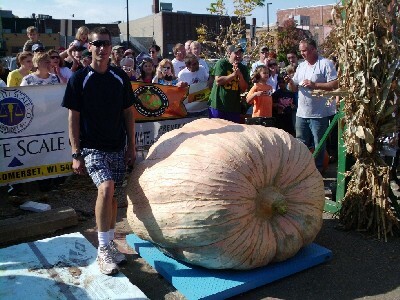 According to Wikipedia, "[t]he current world record holder is Chris Stevens's 1,810-pound Atlantic Giant pumpkin, which in October 2010 surpassed Christy Harp's previous 2009 record of 1,725 pounds." My pie pumpkin was more in the 3 1/2 pound range. The pumpkin in the Pain au Potiron is peeled and diced and added raw as the dough is mixed. In addition the pumpkin is seasoned with pepper and the dough is enriched with some olive oil. I baked the loaf in my French Bread Pan, it being a French Bread Pain. It baked up nicely, with the pieces of pumpkin throughout. I again baked it in my French Pain Pan. Instead of slashing the dough with a serrated knife I have taken to snipping it with kitchen shears. This loaf was definitely "spiked" with pepper, which gave it a nice warm kick, but not too much. Just right. Pumpkin chucking is a competitive activity in which teams build various mechanical devices designed to throw a pumpkin as far as possible. Catapults, trebuchets, ballistas and air cannons are the most common mechanisms. Some pumpkin chuckers breed and grow special varieties of pumpkin under specialized conditions to improve the pumpkin's chances of surviving a throw. Easy Low Fat Pumpkin Cake. This is one of our favorite fall recipes, and I really recommend that you click on the link and try it (the recipe calls for canned pumpkin, so you need not roast your own). With the Pumpkin Bread behind us it was on to Il Bollo. According to the Encyclopedia of Jewish Food the Bollo originated in Portugal and Spain as an enriched, anise flavored bread. When the Sephardic Jews were expelled from the Iberian Peninsula by Ferdinand and Isabella in 1492 they took their Bollo with them to other countries (they could take their dough, but were not permitted to take gold or silver or money). The version which evolved in Italy, Il Bollo, is richer, characterized by larger amounts of eggs, oil, and honey. Il Bollo is served throughout Sukkot, and to break the fast of Yom Kippur. The HB in 5 version of Il Bollo is also enriched with oil, eggs (I used egg substitute) and honey and flavored with anise (and vanilla). It has less whole wheat flour than most loaves we have baked, making it less dense than some. (In the notes to the recipe Jeff offers that you can boost the whole grains by making a version based on the Whole Wheat and Wheat Germ dough.) I baked the first loaf as a Bollo, though I skipped the egg wash and extra anise seeds. This bread smelled wonderful baking and tasted just as good. It was definitely one of our favorites. It makes great toast, too. For my second loaf I went for a braid, and rolled the strands in anise seeds sprinkled on the counter before braiding. It was just as good. I have baked my way through every recipe in Healthy Bread in Five Minutes a Day by Zoë François and Jeff Hertzberg. (In the interest of full disclosure, did not bake every combination or permutation of every recipe--Zoë and Jeff often provide several dough options that can be used in a recipe.) That is 42 "official" assignments, plus 1 recipe inadvertently omitted from the schedule, plus 2 warm-up assignments, plus a few bonus posts. We owe this whole adventure to Michelle, who started this all off on October 19, 2009, when she first posted about a group to bake its way through HB in 5. She is really great and I wish her all the best. I miss her posts. Zoë and Jeff (to whom we also owe this adventure) posted about the group on their website on October 20, 2009, which is how I found out about it. And my first (ever) post was on November 10, 2009--I was much more pithy then. Through the process we have forged some new friendships, learned from each other, gotten lots of good tips, and had some fun. And here at least, we have eaten pretty well. And now, we are done. So, be sure to tune in next time (say what??) for a review of our favorite loaves from HB in 5. Great looking breads. I have to commend you for baking all the assignments, and of course bringing powertools into the discussion when possible. Hard to believe it's over. Where to go and what to do next?! I certainly hope we all keep in touch or maybe start a new adventure somewhere, somehow. Wow, I can't believe you did every assignment! I have enjoyed your posts tremendously and look forward to reading more! Guff, I have loved your posts which I have found not only entertaining but educational. And, as I might have mentioned before, your bread looks delicious! I ended up being a rather early drop out as my husband quickly tired of the unique 'sour dough' flavor of most of the breads. (there are just the two of us at home now) So, I sadly have had to live vicariously thru you and the others. It has been a wonderful journey- Thank you! Great job! You finished the race. You've been a great inspiration along the way. Your breads always look great and your posts make me laugh. Thanks for the memories. I hope we can bake together again. Well, I enjoyed each and every post and I also learned a lot of interesting tidbits about or not about bread. Thanks for all your efforts. I thought about, but never got around to, sending a post--just being lazy. My goal to to make English muffins some day. I have been very fortunate to be able to "go along for the ride" on Geoff's amazing bread making adventure. He has poured his heart into each and every recipe and put all his efforts into making each bread look, taste and feel (texture) delicious. In my mind there are a few stand outs including this week's Il Bollo. Wow, that is some wonderful bread! But, each bread has been it's own unique experience that I have enjoyed. I admire Geoff for sticking with it. Congratulations Geoff! I can't believe it is really over. Every bread you made was better than the last. Of all your hobbies this one is my favorite so I hope you keep the bread coming. Now that you have made every kind does that mean you are taking requests? I think it is time for pumpkin pie brioche!